Carlos Zambrano completed his anger management and headed to Arizona. The embattled Cubs' right hander was told to please go away after he unleashed his crazy all over Derek Lee on June 25th. Big Z explained that he was just trying to fire up his teammates and he was promptly shipped to New York for anger management therapy. With any luck, the therapy will help stop the anger sharks from swimming in his head. But I doubt it. 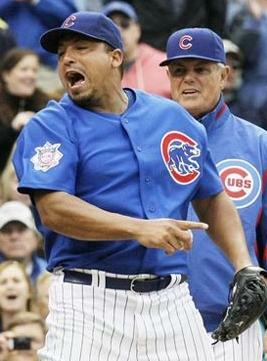 Of course, the Cubs could probably live with the occasional cooler-punching, teammate-reviling tirade if Zambrano was pitching like his former self. Big Z came into this season a career 3.51 ERA, 127 ERA+ pitcher. He kicked this season off by throwing 1.1 innings and giving up 8 runs on 6 hits and 2 walks. He continued to struggle and moved to the bullpen for a stint. 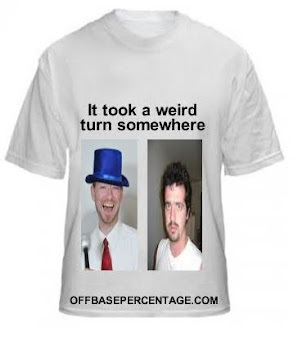 He moved back to the rotation in June but melted down on the aforementioned 25th when he pitched 1 inning and gave up 4 runs on 4 hits. He did record an impressive 43 SAL (screaming at Lee). The Cubs are in a tough spot because trading Zambrano wouldn't net them much and they'd have to eat his salary. Too bad the Raiders aren't a baseball team, huh Chicago? I think they should just stick him back in the bullpen and have him yell at the opposing team's bullpen for 9 innings. Like a middle relief agitator.